The pediatric cardiac surgical program brings together numerous pediatric specialists who are trained in providing peri-operative care for children undergoing heart surgery along with the support systems only available at a major cardiovascular center. The program has an interest and expertise in providing surgical care for patients with congenital heart disease from the newborn period through adulthood. A multidisciplinary team from cardiovascular surgery, cardiology, pediatric anesthesia and critical care provide around-the-clock care of your child during and following surgery. Only fully trained board-certified physicians are entrusted in the care of your child. These physicians in conjunction with intensive care nurses meet daily to evaluate your child’s need and create an optimal plan for his recovery. After surgery, our policy of 24-hour visitation allows parents to remain with their child in the critical phase of recovery. Family sleep rooms are available in the hospital. 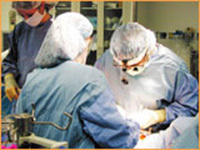 With newer surgical techniques, improved anesthetic management and post operative care, many patients with simple surgical problems are being discharged from the hospital in less than 48 hours. 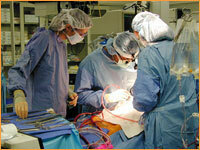 These children have smaller incisions, fewer invasive tubes and more rapid in-hospital recovery. We believe that once a child has passed the critical phase following surgery, the best place for further recovery is at home, in the most familiar and comfortable environment for the child and family.